Last night Taylor Reavely was honored as the Collegiate Athlete of the Year for Fellowship of Christian Athletes. 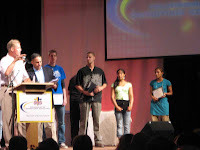 He has been leading the huddle at Clackamas Community College this past year. They have seen record numbers of students involved. Cathy Woods, the Volleyball Coach at CCC, was also named Coach of the Year for her support of Taylor and the huddle at Clackamas. Taylor was asked to speak and give his testimony for the entire Portland Area FCA gathering. 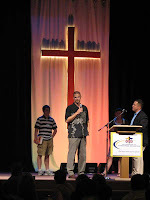 He shared the platform with Olympic wrestler turned pastor, Dan Russell and Neil Lomax, former NFL quarterback. As some of you remember, I used to lead a group at West Linn High School. Several parents and students are looking forward to trying to start a huddle there next year. It represents yet one more good opportunity to serve the High School. The Elkins and the Hannifans were present, as well, to explore the possibilities of being part of a group at Rex Putnam High school and starting a group at Milwaukie High Schools. Pray for our young people as the endeavor to reach their campuses. Way to go, Taylor! You make me proud, and I'm not even your Mom! Wish I could have made it last night, but had other family commitments already in the works before receiving an invite. Looking forward to seeing a Huddle become organized and how the younger generation especially can see their sports and other outlets as contexts to live as missionaries. Very Cool - Congrats Taylor! Good to see also that Rex Putnam and Milwaukie High may soon have FCA there! God is good! Baby News: It's a boy! It's a boy!